Ealing Studios head Michael Balcon had strong views on propaganda and about "how to put films to work in the national interest in wartime," as he put it. It was Balcon whose voice was raised loudest in protest when the government requisition film studios to use as depots and munitions stores and (briefly) closed cinemas for public safety reasons. Film, Balcon believed, was not only vital for maintaining public morale and good humour, but as a tool for conveying valuable information and propaganda. Balcon 's Ealing would become associated with a form of popular propaganda in its wartime feature films, particularly around 1942-43, when the studio aligned itself with democratic 'People's War' values in films that stressed 'ordinary' heroism and shared endeavour. Films such as The Foreman Went to France (d. Charles Frend, 1942), Went the Day Well? (d. Cavalcanti , 1942), The Bells Go Down (d. Basil Dearden, 1943) and San Demetrio London (d. Frend, 1943), were increasingly coloured by a low-key 'documentary realism' and set Ealing apart from other studios, which tended to favour stories set among the officer classes (as Ealing itself had at the very beginning of the war). The war was crucial in forming Ealing 's sense of itself and its audience. But though its feature films were the most visible sign of the studio's new direction, the revolution had more inconspicuous origins. Between 1939 and 1946 Ealing produced some thirty shorts, with a variety of propaganda subjects and forms: narrative information films, straight documentaries, 'story' documentaries, comic 'instructionals', campaign films, even satire. In the process, many of Ealing 's new generation of directors and technicians honed their skills, and imbibed a documentary ethos that they would carry into their feature films. But until recently the short films themselves were largely forgotten, some of them apparently lost, and many more unavailable to view. Ealing 's first toe-dip into propaganda filmmaking came in Spring 1939, with a commission from the Ministry of Labour for a short film to encourage public volunteering in the face of the growing threat of war. Happy Family (d. Walter Forde) was made quickly and cheaply, and released into cinemas that June. Despite its flaws as propaganda, the film's use of a fictional scenario, in place of the more conventional combination of documentary images and a forceful narrator, evidently impressed the Ministry of Information , even if it upset some documentary filmmakers. Several more official commissions followed in Spring/Summer 1940, mostly from the MOI , now formally responsible for wartime propaganda. Three films dramatising the theme of 'careless talk' - All Hands , Dangerous Comment and Now You're Talking (all d. John Paddy Carstairs) - were released simultaneously in May 1940. Two further films, Food for Thought and Salvage with a Smile , directed by Adrian Brunel and using more light-hearted fictional scenarios, were produced for the MOI 's 'Five-Minute Films' scheme, in which pithy propaganda messages were distributed free to cinemas to play in their main programme. But Ealing 's propaganda was about to change course. Balcon 's relationship with the MOI was already a difficult one - fueled by his frustrations around government's treatment of the commercial film industry and what he saw as a lack of clarity over propaganda in film - but it broke down completely in late 1940. Ealing declared that from now on it would develop its own propaganda films, through an in-house 'shorts unit', which would be released to cinemas on a commercial basis. The new unit was headed up by the Brazilian-born Alberto Cavalcanti , a creative giant whose experience stretched from European feature films to the avant-garde and, more recently, the British documentary movement - he joined Ealing from his position as acting head of the GPO Film Unit . Under Cavalcanti , Ealing 's propaganda films pulled sharply away from the fictional treatments of the MOI-commissioned work and towards more orthodox documentary practice. The first fruits of this move could be seen in Ealing 's final short releases of 1940: Sea Fort (d. Ian Dalrymple), about a coastal defence installation, Young Veteran (d. Cavalcanti), about the new generation of soldiers who enlisted at the start of the war, and Mastery of the Sea (d. Cavalcanti), about the vital work of the naval blockades. Shorts releases in 1941 and 1942 followed in a similar vein: Guests of Honour (d. Ray Pitt, 1941) looked at the presence in London of resistance forces from France, Czechoslovakia and elsewhere, Find, Fix and Strike (d. Compton Bennett, 1942) at the training of recruits to the Fleet Air Arm. Less typical was Yellow Caesar (d. Cavalcanti, 1941), a satirical biography of Mussolini which made unusually free use of archive footage and sound, and featured a caustic commentary co-written by journalist (and future Labour Party leader) Michael Foot . By early 1942, Ealing made its peace with the MOI . Go to Blazes , a late entry in the Five-Minute Films series, was a comic 'how not to' film, in which Ealing regular Will Hay ineptly attempted to deal with an incendiary bomb. 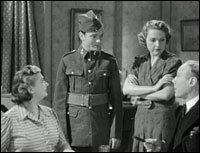 Two short films promoting war savings took a similarly light-hearted approach, with Tommy Trinder starring in the mini-musical Save Your Shillings and Smile (d. Harry Watt, 1943) and Hay's sometime co-star Claude Hulbert taking the lead in the entertainingly daft Did You Ever See a Dream Talking? (d. Basil Dearden, 1943). Meanwhile, the unit's more serious 'shorts' were taking a different path. Greek Testament (d. Charles Haase, 1943), following a resistance fighter on Crete, and The Return of the Vikings (d. Charles Frend, 1944), about a Norwegian whaleboat skipper who retrains as a soldier, used a hybrid of fiction and documentary known as 'story documentary', pioneered by Harry Watt and others at the GPO and its successor, the Crown Film Unit . Watt joined Ealing in 1942, and his first feature, Nine Men (1943), took a similar approach. The debt to Watt was acknowledged in Cavalcanti 's The Sky's the Limit (1943), an account of a bombing raid on Hanover with a strong resemblance to Watt 's feature-length Target for Tonight (1941). By 1944, the end of the war was in sight and the shorts unit's work was largely done. Its apprentices graduated to features, establishing themselves as the filmmakers who would shape Ealing 's postwar glory. Although their films gradually retreated from the documentary style, their documentary education still sometimes showed through, particularly in the attention to detail and their feel for locations: the bombed-out streets of Hue and Cry (d. Charles Crichton, 1947) and Passport to Pimlico (1949), the seedy bedsits and pool halls of The Blue Lamp (d. Dearden, 1950), the docklands of Pool of London (d. Basil Dearden, 1951). Cavalcanti left Ealing in 1947, but his influence lingered far longer.